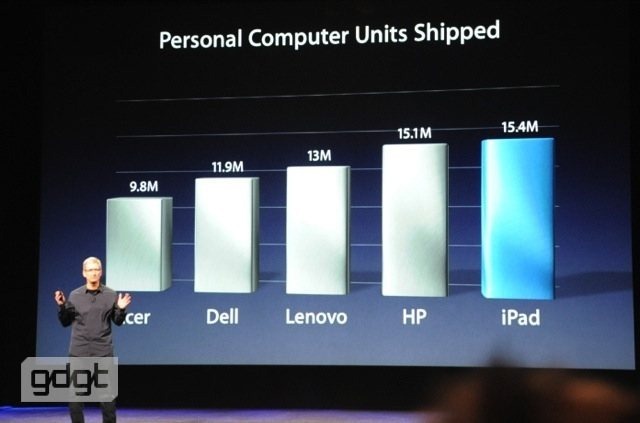 As usual, Apple shared lots of huge numbers at yesterday’s new iPad announcement event. 25 billion App Store downloads, 76% of Apple revenues come from Post-PC devices, 352 million of those devices sold, over 100 million customers on iCloud already, and so on. We sold more iPads in the last quarter alone than any PC manufacturer sold in their entire line. There were more iPads sold last quarter than all of HP’s PC sales for all their models combined. And the same goes for the entire line of PCs for Lenovo, Dell, and Acer. So either you count the iPad as a PC and it’s the best-selling PC, or you say it’s not a PC and then you’d have to say the Post-PC era is well and truly here now. iPads are the best computing value these days. I don’t think that a $399 PC can have the same functionality. If we could find a $399 PC!! And this is if we disregard portability, convenience and system stability. Those are impressive numbers but I don’t agree with your final assessment. The iPad is definitely not a PC — it’s still more of a media/internet consumption device than anything. For a significant percentage of owners the iPad is probably a $500 Angry Birds player and Facebook portal. You can’t assume we’ve hit the post-PC era based on those numbers alone. Given how saturated PCs already are in the market it doesn’t surprise me that sales are low in comparison to tablet sales. What those numbers don’t show is how many of those tablet buyers also have and still use a PC. When people start ditching their PCs and laptops entirely then we can call it the post-PC era. iPADs are a great device for consuming internet content, but nobody can use an iPAD as a general purpose computing tool. Just try to manipulate big data files, write down presentations or summarys or more specialized task such as CAD, Graphics, Coding …and a large etc…. we are still very far away of the post pc era. I do not know anyone that bought and iPAD for her or his only computing tool or environmet. I am writing down this post on and iPAD , but my Work’s laptop and my almost made at my need Desktop still have large chunks of time…. And more relevant time that means $ to my wallet…. Hah they wish, PC era is far from over and desktop PCs are way to go for many people. You will never play battlefield 3 on your ipad or any other tablet, also it is totally different experience when you watch a movie on 11″ screen or 32″. I don’t even understand how the before dead tablet market got so popular ever since there is ipad. It is too big for pocket and too powerless for laptop, many reviews back in the day when ipad was out were like, why would ever need one? But it is Apple and so many people just buy it solely because of that, thats how tablets even got popular. PC for price of ipad? You can get a build a decent tower for that budget, that will play all new games, but not at best settings, provided you already have a monitor or if you don’t you can still get a low end desktop and 23″ monitor for that budget and that computer will still do much more than ipad and will still play most new games on low settings.